The flavours of the roast garlic and leek really make this dish! Notes... We often have this with garlic prawns...yum! A lovely recipe for pumpkin lovers! Thanks! 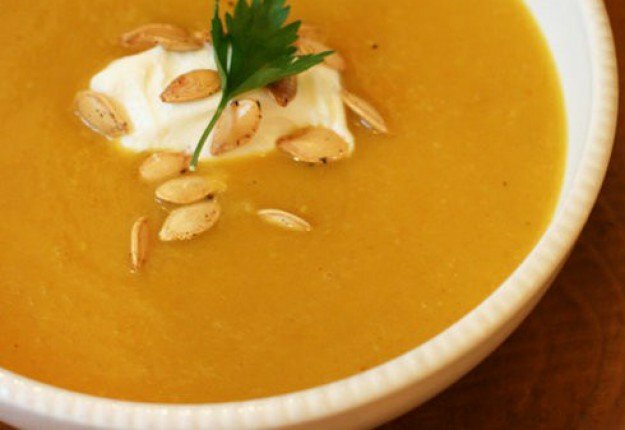 A delish pumpkin soup recipe. Love creamy pumpkin soup. Creamy pumpkin soup and prawns sounds delish. Sorry this has far too much cream in it to be a healthy option for my household. I prefer my pumpkin soup a lot simpler and far less fattening. I should point out this serves at least 10, half a pumpkin is a substantial amount for those concerned about the cream content! I love a creamy soup and shared amongst many is perfect! Golly, roasting the vegetables would really bring out the flavour in them. What a clever idea. Rather than using so much cream, I’m hoping that it would be o.k. to substitute some chicken or vegetable stock instead. Do you think this would be o.k. ?